Received July 13, 2012; Accepted September 4, 2012; Published September 6, 2012. Figure 4. In situ localization of cell wall epitopes in medial longitudinal sections of 3-h-imbibed Lepidium seeds. A, Calcofluor White labeling of Lepidium showing cotyledons (C), radicle (R), testa (T), ME, CE, and PE. B, The LM15 XG epitope was uniformly distributed in embryo cell walls. C, LM19 bound strongly and uniformly to endosperm, testa, and mucilage. D, The LM8 epitope was restricted to the inner face of the endosperm and surface of the testa. E and F, The LM15 XG and CCRCM1 XG epitopes were restricted to the inner wall in the endosperm. G, A related XG probe LM25 bound more extensively than LM15 and CCRCM1. CCRCM1 and LM25 both bound strongly to embryo cell walls. 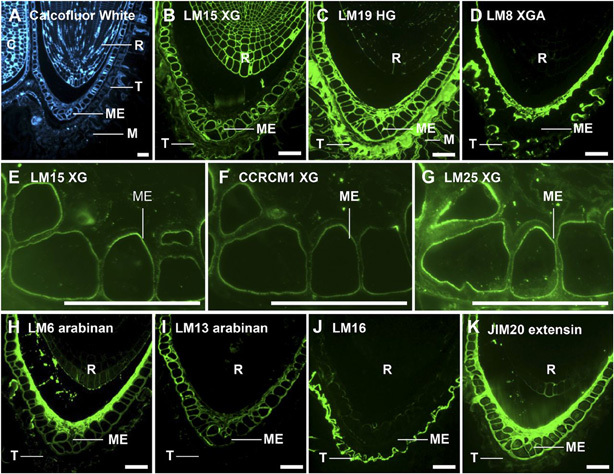 H and I, Localization of cell wall arabinans using LM6 and LM13 revealed spatial heterogeneity; the LM6 epitope was most abundant at the inner face of the endosperm, while LM13 bound more uniformly to endosperm walls. J, LM16 strongly labeled the testa surface and weakly labeled endosperm cell walls. K, Extensin recognized by JIM20 was abundant in the endosperm and at the inner face of the ME. Bars = 50 mm.